One of my first thoughts after crossing the finish line at the Portland Marathon was that I need to run more. Not necessarily more long runs, but more miles in general. 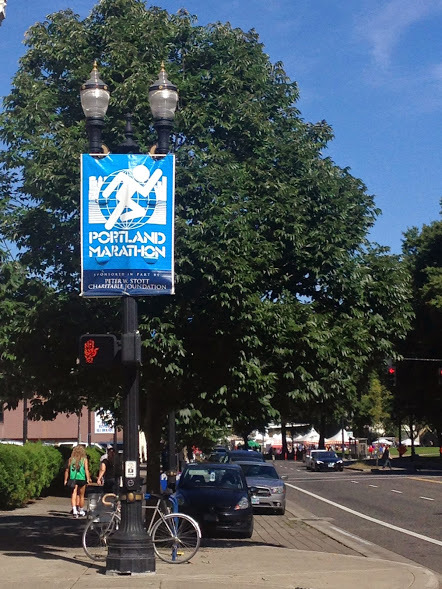 As you know, Portland was my first marathon and I’m a slow runner. The more time you spend on your feet, the greater your risk for injury. As a slow runner, I spend about double the amount of time on my feet running the same mileage that faster runners like my coach does. What does that mean? My highest weekly mileage during marathon training was (I think) 42 miles and I only ventured into the 40s once. Most weeks my total mileage was in the low to mid-30s, and about half of those miles would come from my long run. While many people will run much higher weekly mileage during marathon training, this was a good plan for me because my #1 goal for the marathon was to get there injury free and my #2 goal was to finish uninjured. Last week I ran 32 miles, only 11 of which came from my long run. Slowly increasing my weekly mileage, specifically my weekday runs, is a big goal of mine right now. Why? Because the more you do something the better you get at it! Or at least that’s the basic philosophy I’m subscribing to right now. Of course, I’m still doing dedicated speedwork days AND I’m still working on eliminating my walk breaks. Most days I do 2:1 run/walk intervals, a system that I’ve been using for over a year. Last winter I eliminated my walking breaks (for runs shorter than 5 miles) for a while because the cooler air gives me more energy? It seems that way, anyway. However, as soon as the weather started warming up again I went back to the intervals. This year I’m going to try hard to break the habit and not bring it back! Speaking of changes, last week I cut five inches of hair off! 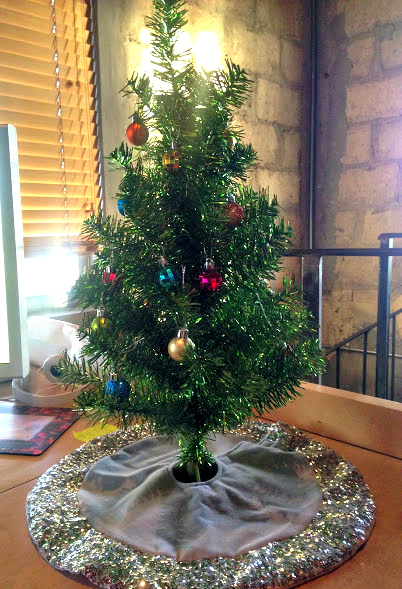 And I put up my mini Christmas tree at work! Man, so many changes! I’m getting crazy over here! I really need to calm down. Somebody please give me a chill pill! Previous Post The Fastest Pace My Garmin Has Ever Seen! Next Post Coming Up With This List Was Really Hard! I remember when i was training for the Baltimore marathon in 2013 I took walk breaks during long runs because it was super hot that summer…and guess what…I ended up walking quite a bit in that marathon. So for my next one I said no walking during training (and ran as slow as I needed at times) and didn’t need to walk at all in the race. So I think its a great strategy, even if its mostly mental! That is really motivating, thanks so much for sharing Lisa! I will get to that place, too! Eliminating walk breaks can be hard! Slowing it down is even harder! When I used to run with walk breaks and was trying to eliminate them I realized I just had to slow the heck down! Not like I was going hyper speed or anything but in order to get my body to adjust I had to slow down. That only lasted a couple weeks and then my body and mind got over the barrier and I was walk break free!!! So happy you are making goals to improve your running!!! I also just cut my hair…I think it was 8″ or so….I felt like my head was naked for days!!!! I know exactly what you mean! When I do my miles with no walking breaks I have to really be conscious of slowing myself down so that I can make it! I hope I can break through the barrier too, just like you! My mileage was super low for training. I know when I run too often I get injured, so I kept my weekday runs “short”, focused on my long runs, and only ran 3 days a week. I do think I’ll do a fourth day for the next time I train for a full, though! I think I wouldn’t have hit the wall so hard with more miles under my belt! From what I have read doing more weekday miles helps with the later stages of a marathon because you’re used to running on tired legs. That makes sense to me! Most of my weekday runs were “short” too – usually 2 to 4 miles. I’d like to do more 5 and 6 miler weekday runs next time! Great haircut lady! Love your cute little tree! I can’t wait to see how your changes pay off this year. I like your change of just focusing on goals you REALLY want. I should probably do that, too. Maybe next year I will run zero 5Ks since I really don’t care about them at all, except for when I am running one! Plans for 2015: PR in a marathon! ….okay, so it’s my firsts marathon and will be an automatic PR, details details. The main changes I’m going to make in my running is to incorporate more speedwork throughout the week. It looks like you’ve already been doing that though. Congrats on your negative splits on your long run 🙂 I also have to keep my mileage lower or I’ll end up with an injury. I’ve been doing one day of speedwork a week since April BUT I don’t think I’ve ever really taken it super seriously until recently. Hopefully our focus on speedwork will help us both PR like crazy in 2015! Your hair looks great! I actually still haven’t put up my tree at HOME. Oy. I need to get on this. I like that you shared how your training has changed since the marathon. Have you figured out which 2015 marathon you’re planning to run? My big 2015 training goals are to achieve a half marathon PR and to go sub-30:00 on the 5K (I feel like I’ve been talking about this sub-30 goal constantly, argh!). I have a third goal that I’m going to sit on for a bit, but we’ll see. Mostly, the theme for 2015 will be consistency! I am still not 110% sure about the marathon. I think I’d really like to do Chicago, but I’ll need to throw my hat into the lottery for that one. I guess after I hear about Chicago I’ll better be able to make my decision. I’ve got my fingers crossed for Chicago! Your hair looks great! and l love the tree 🙂 I have never tried to change from 4 x 1 – maybe i need to try it and see how it affects my pace. I have never run more than 30 miles in a week, I usually average 20, I guess I will be stepping that up soon. I am anxious to get rolling and see how longer runs go. Two hours of non- stop running for me is a big challenge, i am wondering if I will be able to stretch that closer to three hours…It is a long time to be on your feet for sure. You will be able to stretch it to three hours because you’re slowly build up to it! When I started marathon training the idea of running 20+ miles seemed IMPOSSIBLE but then one day it was finally time to do the 20-miler and it didn’t seem that intimidating because I had just done a 17-miler! Have you thought about stretching it out? Last spring when I trained Hunter (my 13 year old) for his half we did 5:1 and that allowed him to run a nice pace but sill gave him the breaks which helped as much mentally as physically. HAHA, you’re right! I usually do my running intervals at at about 11:30 pace so I guess I’m not THAT slow. I am trying to stretch it out to NO walking breaks! And yep, I’ve done 4:1 and 5:1 intervals before and definitely see an increase in my per mile pace when I do that, but I can usually only sustain that for a couple of miles. I’m working on building up though! Ha totally got that, Back to the Future Part 2. So wish the flying cars were around. Ok enough needing out…I think those are great changes for 2015. We can see it through the blog, you are becoming a stronger runner abd now your taking bigger challenges to continue that progress, it’s so awesome. 2015 is all about moving to the next level. No more AG finishes, I want to shoot for overall podiums. Then again this could become a 2016 goal lol. No way, don’t push it off to 2016, you’re totally ready to tackle it in 2015. Maybe not the full marathon, but you can do it for the half, fo sho! I noticed when I did the 1:1 speed intervals on Tuesday that my per mile pace was much faster than when I do 2:1 or straight running! It did make me question a little if I should just do 1:1 all the time! Your hair looks so cute! My goal is to spend more time running too 🙂 If I want to run a half marathon then I actually need to run longer than an hour at a time haha. Haha, yes, just a little more than an hour unless you’re looking to break some records 😀 You can definitely do it though!! I like your 2015 goal of running more miles. I think you can do it because I know you plan and you work your way up to things. You’re a very smart runner! I need to figure out some sort of plan for myself and it needs to start SOON. Right now I am just “doing whatever I feel like” and I need more of a focus. Are you still thinking about another marathon? I am. Maybe a half instead though!? But it’s just so freaking cold here in the winter! I don’t mind training, I just don’t want to run a race in such cold temps and worry about wind and stuff. I think I will have to wait until the spring to do one. I love how great a new haircut feels! And I am a strong believer in evening out those running miles on weekends/weekdays, but I know how difficult it can be! ME TOO! I always forget how good a haircut feels until I go. Everything from having someone else shampoo your hair to walking out feeling like your head weighs 10lbs less is amazing! 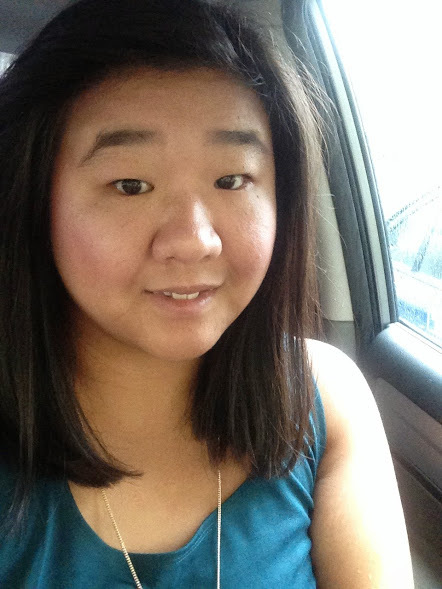 The hair looks great – deep conditioning is amazing! Based on the above message you can tell which marathon is the front runner for me hehe. My guess… PR for you next year! In 2015 I definitely want to incorporate all the other runs (speed, tempo, hills) into my schedule. This past summer I only did one track workout! We’re gonna crush it in 2015. I hope we both get into Chicago and can meet up for a shakeout run before the race. You’ll be zooming on ahead of me come the big day! How many days a week do you run? I’ve heard from so many people that it’s better to run 3 days a week but slowly increase the length of those mid-week runs; but running every day or almost every day increases injury risk. I guess essentially you have to do what works for you individually. If you are seeing improvement then whatever you are doing is working! I run 6 days a week. I used to run 3 days a week and I slowly worked me way up from there when I was training for my first half marathon under a different coach than the one I use now. I’ve been doing the 6 day a week thing now for about a year and a half and knock on wood haven’t been injured yet (except for a couple of kinks here and there, but nothing that’s kept me from training for longer than a week). You’re totally right though, everyone has to figure out what works best for them. I only do one speedwork day each week and sometimes a moderately paced run, but 4-5 days are always nice and easy which I think is what keeps me injury free. There are some nights where my legs want to go go go, but I really hold back and take my easy days easy! I love the haircut! I bet it feels nice to have less hair when you’re working out. I’m looking forward to hearing how your increased mileage strategy works for you. I’m doing something similar with this training schedule and so far I feel good and have noticed that I’m getting a little faster, but I’m definitely worried about injuries coming back. I’ve tried to be extra mindful of little aches so that I can focus on stretching and foam rolling them out, but I’m still a little anxious about it. I hear ya on that. I’ve been extra attentive to any tightness or aches and am making sure to take my easy days SUPER easy. I’m stilling wearing my Garmin on each run, but on the easy days I try not to look at it.